Concerning the description and use of an Instrument, made in form of an Cross-bow, for the more easier finding of the Latitude at Sea. The former Prop. Suppose the Latitude to be known, I will here thew it how it may be easily observed. Upon the Center A, and Semidiameter AB, describe an Ark of a Circle SBN. The same Semidiameter will set off 60 gr. from B unto S for the South end, and other 60 gr. from B unto N for the North end of the Bow: so the whole Bow will contain 120 gr. the third part of a Circle. Let it therefore be divided into so many degrees, and each degree subdivided into six parts, that each part may be 10 minutes: but let the numbers set to it be 5, 10, 15, unto 90 gr. and then again be 5, 10, 15, unto 25, that 55 may fall in the middle, as in the Figure. The Bow being thus divided and numbered, you may number 23 gr. 30 m. from 90 gr. toward the end of the Bow at N, and there place the tenth day of June, And 23 gr. 30 m. from 90 towards S; and there at 66 gr. 30 m. place the tenth day of December, And so the rest of the days of the year, according to the declination of the Sun at the same day. The stars may be placed in like manner according to their Declination, to the year 1670. Arcturus 20 gr. 57 m.
The Bulls Eye 15 gr. 47 m.
The Lions Heart 13 gr. 32 m.
The Vultures Heart 8 gr. 8 m.
The little Dog 6 gr. 0 m.
In Orions Girdle the First at 0 gr. 37 m.
Second 1 gr. 26 m.
Third 2 gr. 9 m.
And so the South crown, the Triangle, the Clouds, the Crosiers, or what other Stars you think fit for the observation. This I call the foreside of the Bow. If you desire to make use of it in South latitude, you may turn the Bow, and divide the back side of it, and number it in like manner, and then put on the months and days of the year, placing the tenth of December at the South end, and the tenth of June toward the middle of the Bow, and the rest of days according to the Suns declination as before. The chiefest of the Northern Stars may here be placed in like manner, according to their declination, Anno 1670. The Pole Star at 87 gr. 32 m.
The first Guard 75 gr. 34 m.
The second Guard 73 gr. 15 m.
The great Bears back 63 gr. 30 m.
The great Bears Tail First 57 gr. 47 m.
Second 56 gr. 40 m.
Third 51 gr. 2 m.
The side of Perseus 48 gr. 36 m.
The Goat 45 gr. 37 m.
The Tail of the Swan 44 gr. 9 m.
The Head of Medusa 39 gr. 41 m.
The harp 38 gr. 32 m.
Castor 32 gr. 33 m.
Pollux 28 gr. 47 m.
The North Crown 27 gr. 50 m.
The Rams Head 21 gr. 30 m.
Acturus 20 gr. 47 m.
The Bulls Eye 15 gr. 37 m.
The Lions Heart 12 gr. 32 m.
The Vultures Heart 8 gr. 08 m.
Orions right Shoulder 7 gr. 19 m.
Orions left Shoulder 6 gr. 2 m.
And so any other Star whose declination is known unto you; which being done. The use of the Bow may be. 1. The day of the month being known, to find the declination of the Sun. 2. The declination being given, to find the days of the month. These two Prop. Depend on the making of the Bow. If the day be known, look it out in the back of the Bow: so the declination will appear in the side. Or if the declination be known, the day of the month is set over it against it. As if the day of the month were the 14 of July, look for this day in the back of the Bow, and you shall find it over against 20 gr. of North declination. If the declination given be 20 gr. to the Southward, you shall find the day to be either the eleventh of November, or the eleventh of January. 3. To find the Altitude of the Sun, or Star. Here it is fit to have two running sights which may be easily moved on the back of the Bow. The upper sight may be set either to 60 gr. or to 70 gr. or to 86 gr, as you shall find to be most convenient: the other sight may be set on to any place between the middle and the other end of the Bow. Then with the one hand hold the Center of the Bow to your eye, so as you may see the Sun or Star by the upright sight, and with the other hand move the lower sight up or down until you have brought one of the edges of it, to be even with the Horizon (as when you observe with the Cross-staff) so the degrees contained between that edge and the upper sight, shall shew the Altitude required. Thus if the upper sight shall be at 80 gr. and the lower sight at 59 gr. the Altitude required is 30 gr. 4. To find any North latitude, by the Meridian Altitude of the Sun at a forward observation, knowing either the day of the month, or the declination of the Sun. As oft as you are to observe in North Latitude, place both the sights on the foreside of the Bow, the upper sight at the Declination of the Sun, or the day of the month at the North end, and the lower sight toward the South end. Then when the Sun cometh to the Meridian, turn your face to the South, and with the one hand hold the Center of the Bow to your Eye, so as you may see the Sun by the upper sight; with the other hand move the lower sight, until you have brought one of the edges of it to be even with the Horizon: so that edge of the lower sight shall shew the latitude of the place in the fore-side of the Bow. Thus being in North Latitude upon the ninth of October: if I set the upper sight to this day, at the fore-side and North end of the Bow, I shall find it to fall to the Southward of 90 upon 80 gr. and therefore at 10 gr. South declination. Then the Sun coming to the Meridian, I may set the Center of the Bow to mine eye, as if I went to find the Altitude of the Sun, holding the North end of the Bow upward, with the upper sight between mine eye and the Sun, and moving the lower sight, until it come to be even with the horizon. If here the lower sight shall stay at 50 gr., I may well say, that the Latitude is 90 gr. For the Meridian Altitude of the Sun is 30 gr. by the third Prop. And the Sun having 10 gr. of Souht declination, the Meridian Altitude of the Equator would be 40 gr. and therefore the observation was made in 50 gr. of the North latitude. By the same reason, if the lower side had stayed at 51 gr. 90 m. the Latitude must have been 51 gr. 30 m. and so in the rest. 5. To find any North latitude, by the Meridian Altitude of the Stars to the Southward. Let the upper sight be set to the Star, which you intend to observe, here placed in the fore-side of the Bow. Then hold the North end of the Bow upward, and turning your face to the South, observe the Meridian Altitude as before: so the lower sight shall shew the Latitude of the place in the fore-side of the Bow. Thus if in observing the Meridian Altitude of the great Dog-star, the lower sight shall stay at 50 gr. it would shew the Latitude to be 50 gr. For this Star being here placed at 73 gr. 48 m. if we take thence 50 gr. his Meridian Altitude would be 23 gr. 48 m. to this if we add 10 gr. 12 m. for the South declination of this Star, it would shew the Meridian Altitude of the Equator to be 40 gr. and therefore the Latitude to be 50 gr. 6. To find any North Latitude, by the Meridian Altitude of the Stars to the Northward. If the Bow be intended only for the North Latitude it may suffice to have the degrees divided only on the fore-side, and then the Stars to the Northward may be placed either on the backside or the inside of the Bow by these degrees: the Pole-star at 87 gr. 20 m. near the 20 day of September, the foremost guard at 75 gr. 45 m. the hindmost guard at 73 gr. 25 m. and the rest according to their declination before mentioned, so the 90 gr. shall represent the North Pole of the world. When any of these stars come to be in the Meridian, and under the Pole, set the upper sight to the Star, hold the North end of the Bow upward, and turning your face to the North, observe his Altitude as before; so the degrees contained between the 90 degrees and the lower sight, shall shew the Altitude of the Pole. Thus the former guard coming to be in the Meridian, under the Pole, if you observe and find the lower sight to stay at 40 gr. the Elevation of the Pole is 50 gr. according to the distance between 40 and 90. If you would observe any of these Stars, at such time they come to be in the Meridian, and above the Pole, you may place these Stars in the Bow above 90 gr. the North Star at 2 gr. 40 m. near the fourth day of September, the foremost Guard at 14 gr. 15 m. the hindmost Guard at 16 gr. 35 m. and such others as you think fittest, according to their distance from the Pole; then setting the upper sight to the place of Star above the Pole, the rest of the observation will be the same as before. But if the Bow be made to serve at large, both in South and North Latitude, then these Northern Stars would be let placed on the back-side of the Bow, by the degrees on that side, according to the Complement of their declinations, that the North Stars may answer to the North Sun in South latitude, is such fort as the Southern Stars did to the South Sun in North Latitude in the former Prop. This being done, let the upper sight be set to the Star which you intend to observe, where placed on the backside of the Bow. Then hold the North end of the Bow upward, and turning your face to the North, observe the Altitude of the Star when it cometh to be in the Meridian, and under the Pole: so the lower sight shall shew the Altitude of the Pole in the backside of the Bow. Thus the former guard coming to be in the Meridian under the Pole, if you observe and find the lower sight to stay at 90 gr. such is the Elevation of the Pole, and the Latitude of the place to the Northward. For the distance between the two sights will shew the Altitude to be 35 gr. 45 m. and the Star is 14 gr. 15 m. distant from the North Pole. These two make up 50 gr. for the Elevation of the North Pole, and therefore is the North Latitude. 7. To find any South latitude, by the Meridian Altitude of the Sun at a forward observation, knowing either the day of the month, or the declination of the sun. When you are come into South latitude, turn both your sights to the back-side of the Bow: the upper sight to the declination of the Sun, or the day of the month at the South end, and the lower sight toward the North end of the Bow. Then the Sun coming to the Meridian, turn your face to the North, and holding the South end of the Bow upward, observe the Meridian Altitude as before: so the lower sight shall shew the latitude of the place in the backside of the Bow. Thus being in the South Latitude, upon the tenth of May, if you observe and find the lower sight to stay at 30 gr. on the backside of the Bow, such is the latitude. For the declination is 20 gr. Northward, the Altitude of the Sun between the two sights 40 gr. the Altitude of the Equator 60 gr. and therefore the latitude is 30 gr. 8. To find any South latitude by the Meridian Altitude of the Stars to the Northward. Let the upper sight be set to the Star which you intend to observe, here placed on the backside of the Bow. Then hold the South end of the Bow upward, and turning your face to the North, observe the Meridian Altitude as before: so the lower sight shall shew the latitude of the place in the back of the Bow. Thus being in South latitude, and the former guard coming to be in the Meridian over the Pole. If you observe, and find the lower sight to stay at 5 gr. such is the Latitude. For the Star is 14 gr. 15 m. from the North Pole, the Altitude of the stra between the two sights 9 gr. 15 m. the North Pole depressed 5 gr. and therefore the latitude 5 gr. to the Southward. 9. 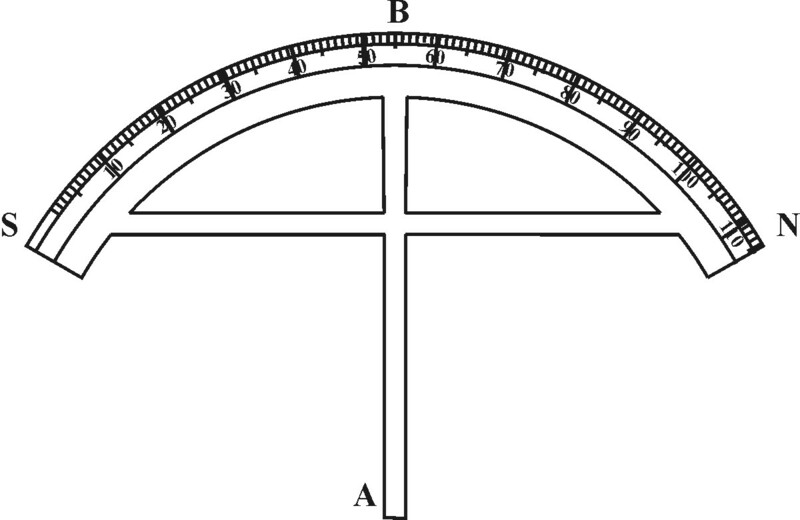 To observe the Altitude of the Sun by the Bow, or with an Astrolabe. Here it is fit to have a third sight (like to the Horizontal sight belonging to the staff) which may be set to the Center of the Bow. If the Sun be near to the Zenith, hold the Bow as when you observe with the Astrolabe, so as the Center being downward the Line AB may be vertical, and the Line SN Parallel to the Horizon, then turning one end of the Bow toward the Sun, you may move one of the sights on the back of the Bow, until the shadow thereof fall on the middle of the Horizontal sight, so the degrees contained between the Vertical AB, and that upper sight shall shew the distance of the Sun from the Zenith. If the Sun be nearer to the Horizon, you may hold the Bow so as the Line SN may be Vertical, and the Line AB Parallel to the Horizon, then observing, as before, the degrees contained between the Line AB, and the upper sight, shall shew the Altitude of the Sun above the Horizon. 10. To find a South Latitude by the Meridian Altitude of the Stars to the Southward. Let the upper sight be set to the Star which you intend to observe, which might be here placed on the foot side of the Bow by the Complement of their declinations, if we knew the true place of such as are near to the South Pole. Then hold the South end of the Bow upward, and turning your face to the South, observe the Altitude when it cometh to be in the Meridian, and under the Pole, so the lower sight shall shew the Altitude of the Pole in the foreside of the Bow. 11. To observe the Altitude of the Sun backward. Set the upper sight either to 60, or 70, or 80 gr. as you shall find it to be most convenient, the lower sight on any place between the middle and the other end of the Bow, and have an Horizontal sight to be set to the Center. Then may you turn your back to the Sun, and the back of the Bow toward your self, looking by the lower sight through the Horizontal sight, and moving the lower sight up and down until the upper sight do cast a shadow upon the middle of the Horizontal sight: so the degree, contained between the two sights on the Bow, shall give the Altitude required. Thus if the upper sight shall be at 80 gr. and the lower sight at 50 gr. the Altitude required is 30 gr., as in the third Prop. Or if you turn the other end of the Bow upward, and set the upper sight to the beginning of the Quadrant, and then observe as before, the lower sight will shew the Altitude. 12. To find any North latitude by the Meridian Altitude of the Sun at a back observation, knowing either the day of the month, or the declination of the Sun. Place your three sights as before on the fore-side of the Bow: the upper sight to the declination of the Sun, or the day of the month, at the North end; the lower sight toward the South end of the Bow; and the Horizontal sight to the Center. Then the Sun coming to the Meridian, turn your face to the North, and holding the North end of the Bow upward, the South end downwards, with the back of it toward your self, observe the shadow of the upper sight as in the former part of the fifth Proposition, so the lower sight shew the latitude of the place in the foreside of the Bow. Thus being in Northern Latitude upon the ninth of October, if you observe and find the lower sight to stay at 50 gr. on the foreside of the Bow, such is the Latitude. For the declination is 10 gr. Southward, and the Altitude of the Sun between the two sights 30 gr. the Altitude of the Equator 40 gr. and therefore the latitude 50 gr. as in the sixth Prop. 13. To find any South Latitude by the meridian Altitude of the Sun at a back observation, knowing either the day of the month, or the declination of the Sun. When you observe in South latitude, place your three sights on the back side of the Bow: the upper sight to the declination of the Sun, or the day of the month, at the South end; the lower sight toward the South end of the Bow; and the Horizontal sight to the Center. Then the Sun coming to the Meridian, turn your face to the South, and holding the South end of the Bow upward, with the back of it toward your self, observe the shadow of the upper sight as before: so the lower sight shall shew the Latitude of the place in the back side of the Bow. Thus being in the South latitude upon the tenth of May, if you observe and find the lower sight to stay at 30 gr. on the back of the Bow, such is the Altitude of the Sun between the two sights 40 gr. the Altitude of the Equator 60 gr. and therefore the Latitude 30 gr. as in the seventh Prop. 14. To find the day of the month, by knowing the latitude of the place, and observing the meridian Altitude of the Sun. Place your three sights according to your latitude; the Horizontal sight to the center, the lower sight to the Latitude, and upper sight among the months. Then when the Sun cometh to the Meridian, observe the Altitude, looking by the lower sight through the Horizontal, and keeping the lower sight still at the Latitude, but moving the upper sight until it give shadow upon the middle of the Horizontal sight: so the upper sight shall shew the day of the month required. Thus in our Latitude if you set the lower sight to 51 gr. 30 m. and observing find the Altitude of the Sun between that and the upper sight to be 28 gr. 30 m. this upper sight will fall upon the ninth of October, and the twelfth of February. And if yet you doubt which of them two is the day, you may expect another Meridian Altitude; and then if you find the upper sight upon the tenth of October, and the eleventh of February, the question will be soon resolved. 15. To find the declination of any unknown Star, and so to place it on the Bow, knowing the latitude of the place, and observing the Meridian Altitude of the Star. When you find a Star in the Meridian that is fit for observation. Set the Center of the Bow to your eye, the lower sight to the latitude, and move the upper sight up or down until you see the Horizon by the lower sight, and the Star by the upper sight, then will the upper sight stay at the declination and place of the Star. Thus being in 20 gr. of North latitude, if you observe and find the Meridian Altitude of the head of the Cosier to be 14 gr. 50 m. The upper sight will stay at 34 gr. 50 m. and there may you place this Star. For by this observation the distance of this Star from the South Pole should be 34 gr. 50 m. and the declination from the Equator 55 gr. 10. m. And so for the rest. The Stars which I mentioned before, do come to the Meridian in this order after the first point of Aries. 16. To find any North latitude on Land, by observation with Thread and Plummet. Set the sight to the day of the month at the foreside and South end of the Bow: then when the Sun cometh to the meridian turning the North end in your left hand toward the South, so as the sight at the Center may shadow the the sight at the day, observe where the thread falleth, and abate 20 gr. if it fall on 70 gr. the Latitude is 50 gr. If on 71 gr. 30 m. in the latitude is 51 gr. 30 m. And so the rest. If the Bow had been made only for finding the Latitude on land I might then have set such numbers to it as needed no allowance. 17. To find any South latitude on Land, by observation with Thread and Plummet. Set the sight to the day of the month, at the backside and North end of the Bow, and when the Sun cometh to the Meridian, turning the South and to your left hand toward the North, observe as before, and abate 20 degrees. Or you may set the sight to the day of the month, at the foreside, and North end of the Bow, and observing as before, the thread will fall on the Complement of the latitude. The right Ascension of these Stars is to the year 1670. The End of the Second Book of the Cross-Staff.